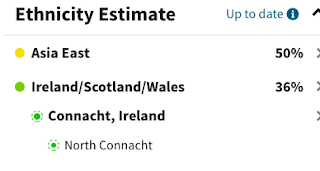 I hadn't gotten my 23andme results on Saturday, when the Ancestry update came through, but they were ready on Sunday! 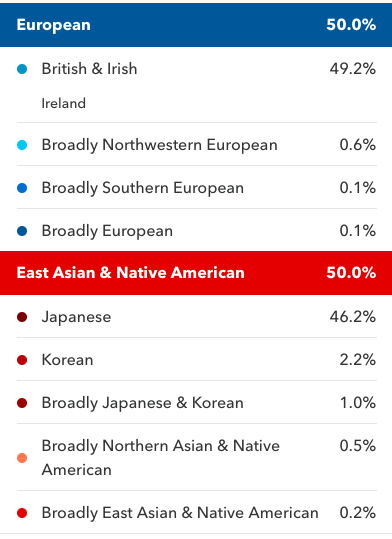 Now, to be clear, I have been raised and identify as half Irish and half Japanese and all of these results bear that out. Now, in the original Ancestry results, there were tiny amounts of other kinds of European (which are now gone from the updated results): Scandinavian, Iberian, British. History tells us that Vikings, Normans, English, Spanish and of course, Celts, all ended up in Ireland and I thought, "Oh, cool! So there's little amounts of all those groups in my DNA!" 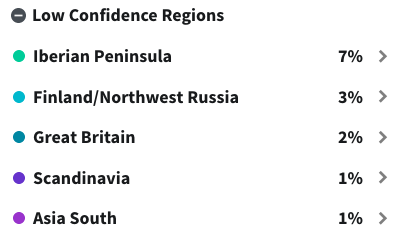 There may be trace amounts of Scandinavian, English, Scottish and maybe some Spanish there, based on 23andme's Broadly European bits. But the Asian side! 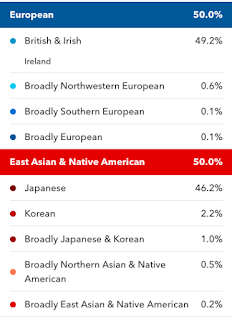 I'm so excited that it shows not only the Japanese DNA (but that there's some Korean DNA, too. 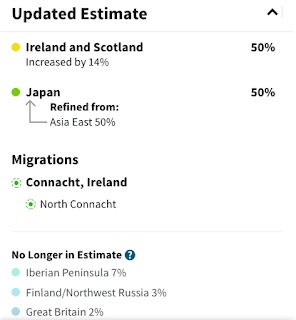 That's not a big surprise, considering ancient Japanese people came over from the Korean peninsula.When I decided to do 23andme, it was largely because Ancestry didn't show a specific country on my Asian side, even if I knew it was Japan. My mom and I were curious about whether there were other ethnicities besides Japanese in our background. I expected some Chinese or maybe even some Southeastern Asian, but I guess not. Also, I guess I some share really ancient ancestry from, like, Siberia or Manchuria and those genes also manifest in Native Americans! The timeline tells you how recently you may have had an ancestor who descended from a single group of people. I was super interested that the timeline thinks I had an 100% Korean ancestor born somewhere between 1750 and 1840, which corresponds to Japan's Edo period. There was some isolationist stuff going on then but the region my family comes from was where the Dutch had their island trading post and it's pretty close to Korea and China. Also, I have 232 Neanderthal variants, which is 90% less than most 23andme customers. Guys, I have a Neanderthal variant associated with my height. I'm 4'10", so....were Neanderthals short? A haplogroup is a genetic population group who share a distant common ancestor on either the maternal or paternal side. Women can only trace their mitochondrial DNA back. Men can trace both mitochondrial and paternal lines back because they have Y chromosones which they inherit from their fathers. My maternal haplogroup is B4b1a1, which traces back to a woman who lived 3,500 years ago. She was from modern day China or Vietnam and the B4 haplogroups are common in East Asia. Wow, you understand those halogroups better than I do. I barely paid attention to mine. I want to go back and look at it now. But it's nice 23andMe can break down the Asian like that. They haven't been able to break down the African yet, but Ancestry.com is doing that, so I'm covered. Apparently I have 65 Neanderthal variants, which they say is 99% less than most people, and apparently zero of them are associated with "Neanderthal traits." So I guess my lack of back hair has to do with something else. Lol! Oh wow, so you're not Neanderthal at all! I may be completely wrong but I think the Neanderthal traits come mostly from Europeans? The height trait was the only one that popped up. And I guess Neanderthals were short?